What if I am not happy with the assessor’s decision? POPLA is a one stage process and there are only two possible outcomes for an appeal brought to our service: either the appeal is allowed or it is refused. We understand that it is disappointing and even frustrating when an appeal results in an outcome that you were not hoping for, however, our role as an impartial appeals service means that quite simply, we must base our decisions upon the factual evidence presented to us. If it is clear that a procedural error has been made during the assessment of your appeal, we might review the case and make changes where we deem necessary. MIL Collections are discontinuing cases where they know they cannot win. Here are a selection of recently discontinued cases. MIL have started to realise that none of the claims they have filed are viable, and as judges have been increasing the amounts awarded against them on the grounds of unreasonable behaviour, have been limiting their losses by discontinuing claims. This saves them the £25 hearing fee, and more importantly, the £200 - £300 to get a solicitor to turn up on their behalf and try and argue a lost cause. MIL have also been trying it on. It is common for them to try and squeeze out £50 from the claimant in a last ditch attempt before discontinuing. If you receive one of these letters, chances are that the next letter will be to discontinue. If you have not received one of these letters then it is possible MIL think they might win in court because you have not filed a robust defence. The two main winning points have consistently been that there is no valid deed of assignment as the deed does not list the parking charge references purchased, and the claim smacks of champerty and maintenance as not debt exists; only the chance to sue for an amount which the parking company have made little attempt to validate and so which may or may not exist. More recently thew fact that MIL Collections have been filing witness statements in the name of a fictitious comic book lawyer has also been their downfall, but this at least can easily be corrected by them. To change your defence usually requires you to file papers with the court and MIL, and costs around £50. The Prankster recommends you do update your defence, but give MIL the chance to fold first. To The Prankster's best knowledge, MIL have lost all contested hearings so there is no reason not to lay it on the line to them. I am intending updating my defence to include the following points. In order to save both parties money, I suggest that you discontinue the claim. You have 14 days from the date of this letter to do this before I file my new defence points, which will increase your costs should I later prevail. This offer is WITH PREJUDICE and I will include this in my evidence to the court. If they don't respond within the 14 days, then file paperwork with the court and MIL, along with appropriate fee, to add the new defence points. MIL Collections appear to have finally realised that filing witness statements in the name of a fictitious comic book lawyer is not a winning strategy. 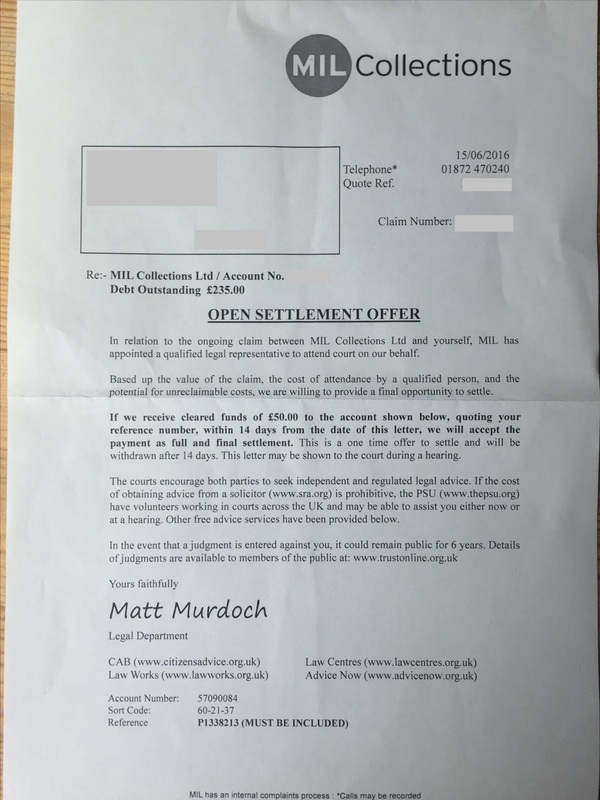 In this case, "Matt Murdoch" filed the initial witness statement, but following a challenge from the defendant, MIL asked for this witness statement to be discounted. Instead Alan Davies, the managing director of MIL Collections filed an almost identical witness statement. Mr Wilkie represented the defendant and the claimant was represented by a lawyer who was only handed the case papers the day before. Unusually in these cases she did not approach the defendant beforehand and the first communications was to inform them that the judge was ready to hear the case. The judge was not happy with Alan Davies witness statement, which was filed late, and was also not impressed that Alan Davies had not bothered to turn up and had not informed the court he would be absent. The case was adjourned to be relisted on the first available date 14 days from today, so that Alan Davies could turn up and explain his actions. A time of 1.5 hours was allocated rather than the 30 minutes today. Costs were reserved. The Prankster has connections in Truro who inform him that the new-fangled inventions known as the 'motor car' and 'train' have made their way as far south as Cornwall. The Prankster therefore has no idea why Mr Davies could not be bothered to turn up, especially as he managed to get to Parkex last week. This was a Matt Murdoch/k case, with the fictitious blind lawyer preparing and signing the witness statement for MIL collections. This was always going to cause problems for MIL as comic book characters have difficulty in materialising in court in the real world. The defence was fully prepared by HO87, before handing the hot seat to to John Wilkie. The Defendant contacted MIL to point out the Murdoch/k issues as recently as 8 June, but they were adamant they were proceeding. Given the recent successes with the Mr Murdoch/k issues, a Preliminary Application was prepared, together with a Costs Schedule, and these were sent to MIL at 3.45 on 14/06/2016 with copies for the judge on the day. AS it happens, timed at 11.34, but received at 19.34, came a "notice of discontinuance" apparently signed by MIL Collections, and not served on the Defendant. say a word. Costs of £50, to be paid within 14 days. Michael Schwartz is currently subject to practice restrictions as detailed on the SRA site. 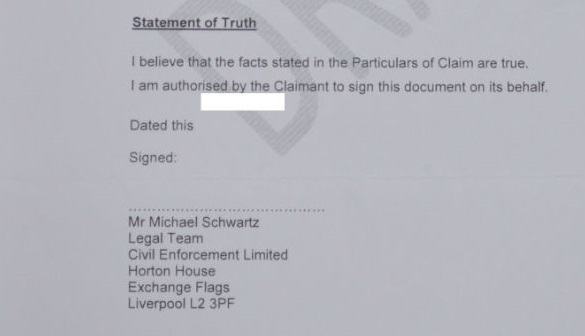 Despite these restrictions, Michael Schwartz continues to work for the legal team of Civil Enforcement Limited, sending out dubious letters before claim. The Prankster questions whether this is or is not 'acting as a solicitor'. 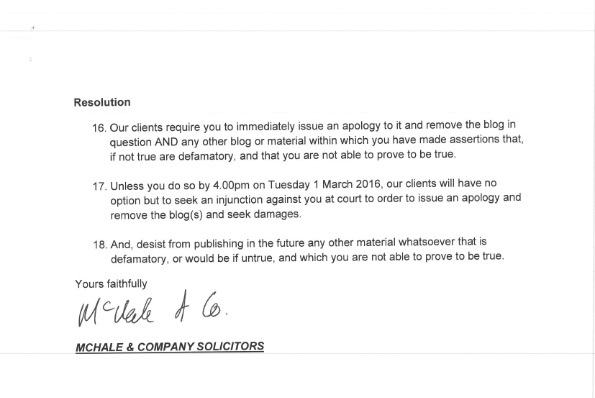 If anyone receives such a letter before claim, or any other document wher eMichael Schwartz appears to be acting as a solicitor, The Prankster recommends you send a copy of your evidence to report@sra.org.uk so they can investigate. Meanwhile, you should also treat the letter as a genuine letter before claim and respond accordingly. The defendant was timed at 2 hours 10 minutes 48 seconds from entrance to exit at Peartree Services, Oxford, which included time spent at the petrol station. The actual time parked would have therefore been well within the British Parking Association grace periods, including the grace period at arrival and the mandatory 10 minute grace period on exit. The judgment found that the signage at Peartree services Oxford was not reasonable or transparent. The numerous signs stating "two hours free parking" would lead the reasonable person to assume it was time spent parking in the car park and that did not include time spent in the petrol station or associated services as ParkingEye were claiming. Nobody from parking eye attended apart from a legal person externally employed. Judgment was swift and contained criticism of the claimant's largely irrelevant automated bundle. The Prankster considers that cases like this should never make court. They bring the parking charges industry into disrepute, clog up the court system and cause stress and inconvenience to motorists. The time spent was well within the limits mandated by the code of practice and should have been picked up by ParkingEye's infamous '19 point checking system'. The ANPR cameras are clearly sited in the wrong place if they include time spent in the petrol station. Lastly ParkingEye's legal team should have picked this up once the defence was filed and should have dropped the claim at that point. In the past several optical illusions have puzzled web users. Is the dress black and blue or gold and white? Can you see the panda? Where is the hidden ipad? Now a new illusion is sweeping the globe. Where are the double red lines? In a parking notice from Vehicle Control Services the parking company claim the vehicle is parked on double red lines. But where are they? Here are their CCTV images, reproduced at the original quality. 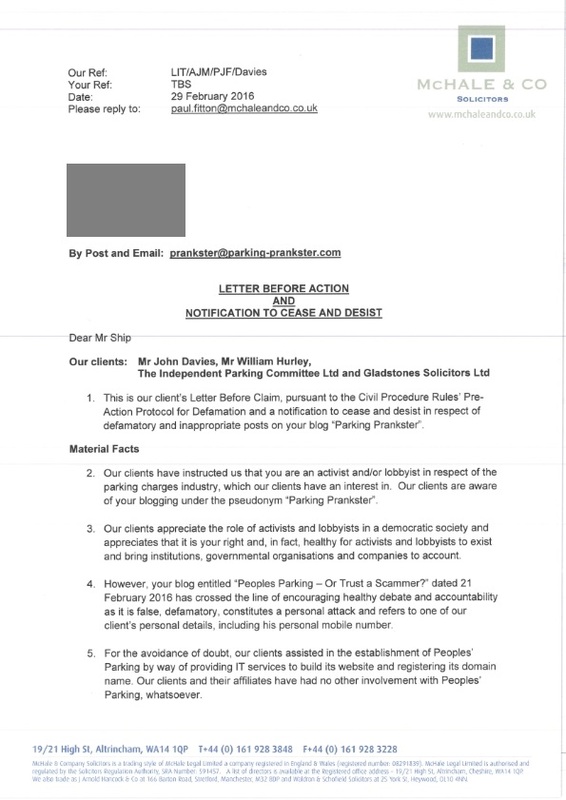 So far, only one person in the entire world has managed to see the double red lines; an assessor (who wishes to remain anonymous) who works for the "Independent" Appeals Service owned by Will Hurley and John Davies of the IPC, a trade association for the parking charges industry. I am also shown evidence that ’No Stopping’ signs exist adjacent to the Appellant’s vehicle and that the vehicle is parked on double red lines. The Prankster understands the duties that disability legislation places on employers, but considers that employing blind people to examine photographs is not best practice. Perhaps the IPC are employing them for their clairvoyant capabilities? The Appellant appears to suggest that the Operator has no legal standing to form contracts or charge drivers. This site has been audited by the IPC and a copy of the landowner’s authority has been provided to them as part of the audit process. In this appeal procedure the onus this is on the Appellant to prove their case on the balance of probabilities. I am satisfied from the evidence provided that that the Operator has the authority to issue and enforce Parking Charge Notices on this site. The Assessor appears to be blissfully unaware of the dubious competence of the IPC audit process, and that large numbers of IPC companies have found this out to their cost in the courts, where real judges have ruled that the company does not have the right to issue charges after all. In several cases the IPC have been so incompetent they did not even realise the signage at the car park was in the name of a different operator altogether. Amazingly, the Assessor's clairvoyant properties let them down later. In this case the registered keeper was at home cooking at the time of the incident, and produced witness statements both from herself and a vehicle passenger, together with phone logs to prove this. 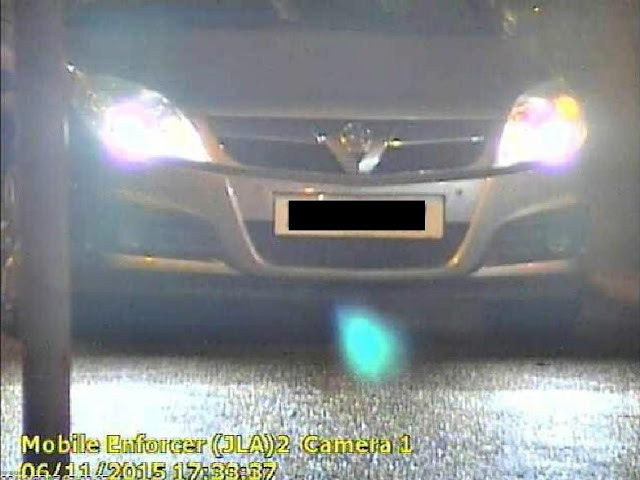 As well as this, the operator identified the driver as male, whereas the keeper is female. 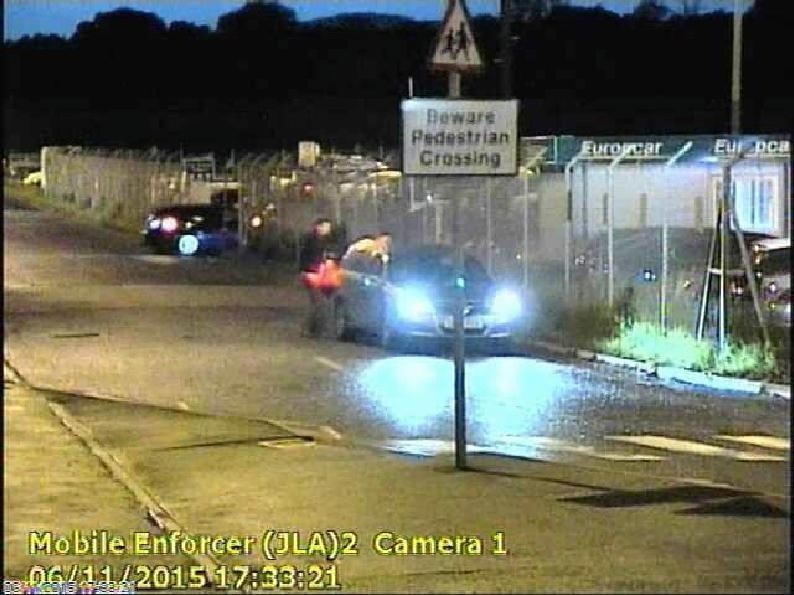 Even with this overwhelming weight of evidence, the assessor choose to believe that the keeper was driving. As the Appellant provides no documentary proof as to their whereabouts I am not satisfied that the Appellant has proved that they are not the Driver as appears to be claimed. Finally, although the assessor claims to be either a barrister or solicitor, it is clear to The Prankster that one of the IAS's infamous baristas must have sneaked in and assessed the case instead. Any competent legal professional would know that Elliot v Loake establishes nothing of the sort. In any case, any competent legal professional would know from reading the transcript that no legal principle is established. The case is simply a finding on the facts. The motorist did complain to the Lead Assessor of the IAS , former judge Bryn Holloway. However they only received a generic reply refusing to investigate. 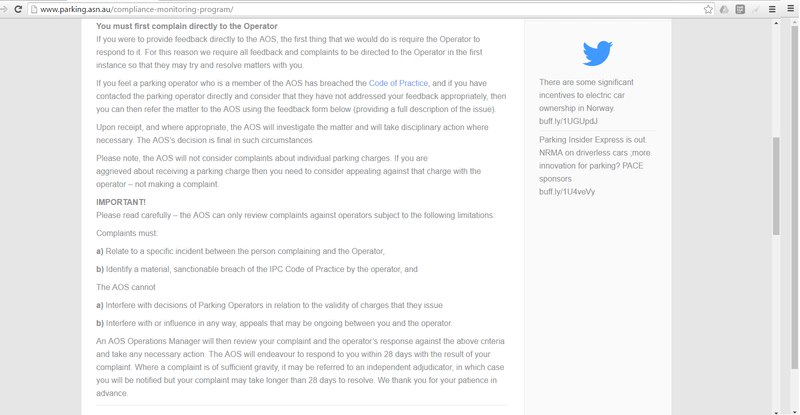 So, the IAS appears to be employing blind, incompetent assessors who are institutionally biased in that they believe operators statements without any supporting evidence, but disbelieve motorists statements even with overwhelming evidence, with a lead assessor notable only for his inability to take meaningful action in the many cases where miscarriages of justice have been reported to him. The Prankster calls on the government to shut down the IPC until they provide a fair and impartial appeals service. Until this happens, The Prankster calls on Bryn Holloway to step up to the plate, do his job properly and ensure that the assessors are competent and impartial, rather than the disgraceful assessments he is allowing on his watch. As for the assessor, no wonder they want to remain anonymous with a judgment like that. Where's Wally? Roberto Ices delivery vehicles were spotted on two occasions by Mr Duff, parked on Ransomes Park where the driver was a customer of one of the leaseholders. Following a long war of words, this culminated in two hearing, the second of which was held on June 3rd. Once again Ransomes wheeled out a £3000 a day barrister. Roberto Ices were represented by John Wilkie. Duff did not enjoy his cross-examination, which went into his bailiffs certificate, his corporate status and his business model, as well as touching on the DVLA Judicial Review, and various other cases where apparently Mr Duff had made claims which did not match up with his evidence in this case. The pen he was holding was not usable at the end of the examination, having been broken into several parts. Nonetheless, as a result of Ransomes Park v Anderson being a judgment binding on the small claims judge, Roberto Ices did not prevail, and were ordered to pay £725 within 14 days. In The Ransomes Park v Anderson case HHJ Moloney found for Ransomes as he judged a trespass had occurred and that Ransomes has therefore incurred costs payable to Proserve. However in that case he limited the costs from £150 to £97.50 based not on evidence but because both parties agreed to accept his decision on the basis that it would be cheaper than to come back to court on another day. HHJ Moloney indicated that in subsequent cases it would be better to have some proper evidence as to costs. Key paragraphs in the judgment include the following. Given that finding, was the district judge right as a matter of law, to refuse to make any award to the claimant, and indeed to find for the defendant? The district judge’s judgment rested on two bases: one based on what the district judge perceived as problems with the enforceability of the contract between Ransomes and Proserve; and the other based on the claimant’s failure to mitigate by demonstrating that there was not some more reasonable charge, some more reasonable firm of bailiffs that it could employ. Fourthly, even in a case where the loss is foreseeable, and is actually incurred, it is open to the defendant to reduce the amount of his liability by proving that the claimant has failed to mitigate his loss. That is to say, proving that there were reasonable steps open to the claimant to reduce his loss but the claimant unreasonably failed to take those steps and thus, in effect, unnecessarily increased the amount of his own loss. If a defendant can show that, then he need only pay the lesser sum that the claimant ought to have lost and not the greater sum that he in fact lost. This raises two further issues, relevant not only to this case but also to other similar cases, which I understand have been stayed pending this judgment and will shortly be coming up before other district judges. Firstly, I have said that the burden of proof of absence of mitigation is on the defendant. It is also, however, true that the burden of proof of loss, a related but different matter, is on the claimant. There is no evidence here that I can see that Proserve did do an hour’s work on this case. I have re-read the evidence of Mr. Duff of Proserve, and Mr. Robson of Ransomes, and, so far as I can see, there is no attempt to show that an hour’s work was done, or that any evidence was given to Ransomes that an hour’s work was done. Even on the basis that one accepts that the £150 rate is pro-rata, not for an hour or part thereof, it appears in this case that the claimant has uncritically accepted Proserve’s invoices without requiring any proof or evidence that the specified time was spent. I note that all 18 of the cases on the invoice I have seen are charged at precisely one hour each. That is inherently improbable. To be frank, it smacks to me of an attempt to introduce into a trespass claim the sort of “agreed flat fee” approach commonly used in contractual parking cases, which as I have explained cannot apply in a tort case. What I am referring to here is an apparent failure by Ransomes to prove that it was ever liable to pay Proserve, based on the fact that it did not seek or receive any proof from Proserve that the time had been expended. That is not a ground of appeal in this case, but in future cases I consider that as part of proving its loss Ransomes should plead and prove the amount of work that Proserve did, or is likely on the basis of its general business model to have done, in relation to the particular case in question. Without some evidence of that kind, it is difficult to see how Ransomes could have discharged its duty to prove that it was liable to pay Proserve the amount that Proserve charged it; and if it could not prove that, it would not be able to reclaim the sum from the individual driver. 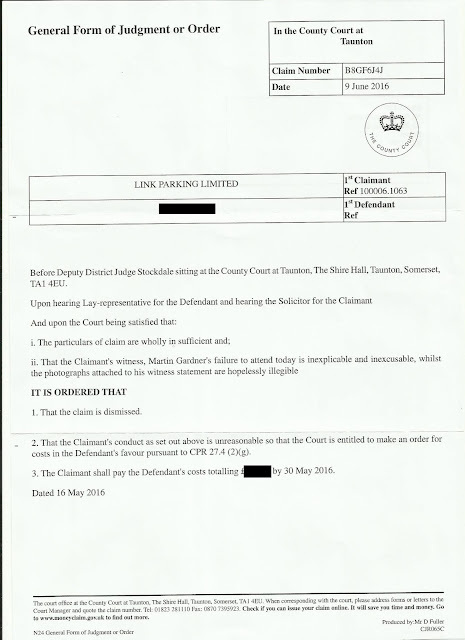 In this case the judge concurred that the burden of proof to establish a reasonable cost for photographing a vehicle and writing to the address on the side of the vehicle (as Proserve are not affiliated to an ATA they cannot apply to the DVLA for keeper details) was on the defendants and that they had not sufficiently proved their case that Ransomes could have found somebody to issue and process a parking charge for under £250. The Prankster finds this somewhat surprising, as large numbers of parking operators make huge profits from issuing parking charges at charges around £70, and of course ParkingEye are able to make a profit on charges of £85 even when they pay £1,000 a week for the right to farm car parks. Additionally, in the Ransomes case Proserve applied to the DVLA for details, which requires meticulous form filling and much effort. Since then they have lost access to the DVLA. Now the only way they can write to the keeper is to note down the address on the side of the vehicle (if there is one) and write to them that way. This is obviously much cheaper than previously. The case was something of a pyrrhic victory for Ransomes as they will have spent over £6,000 on counsel, plus Mr Robson and Mr Duff have spent 2 days in court. The judgment will be no use to them in future cases, and in fact will help defendants by showing them that they will have to bring better proof that Ransomes have shown a "failure to mitigate by demonstrating that there was not some more reasonable charge, some more reasonable firm of bailiffs that it could employ." 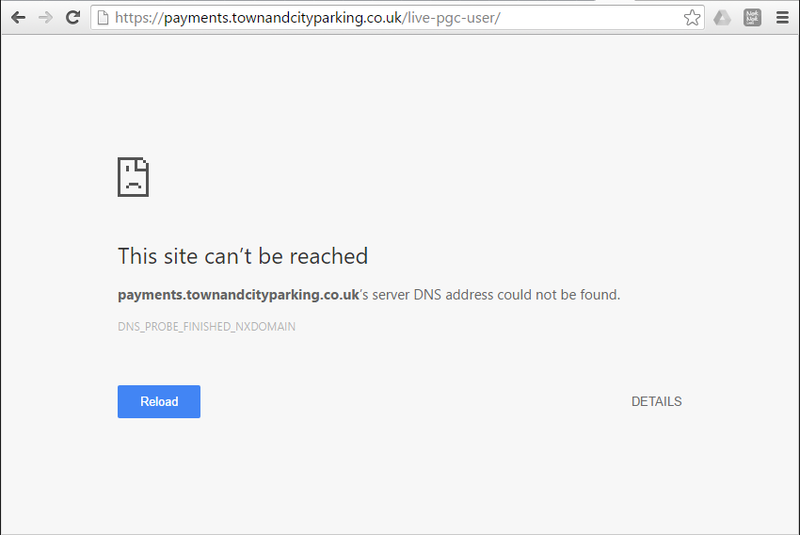 The Prankster is confident that other parking operators can provide services to Ransomes at a much lower rate and will update the blog with future Ransomes cases. 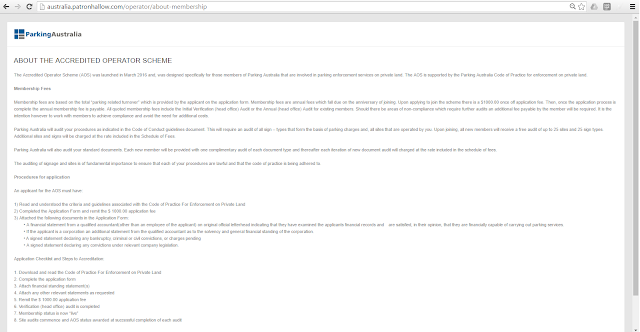 Parking Collection Services, for instance, appear to charge £20 to parking companies to contact keepers and send them a Notice To Keeper, based on the fact that the charge goes up by £20 once they are involved. It is not clear why Mr Duff cannot do the same for £20. Mr Wilkie is now 20-4, regrettably. The Prankster will let Stacy tell the tale in her own words. Stacey cannot drive, as she has epilepsy and problems moving-her car is registered to her under the motability scheme. hello my name is Stacey. I am little scared because I can not see my advocate for while to help me. and I have got a reply from the ticket people at Smart parking who we wrote to try and exsplain why I could not pay the meter. I was on holiday in conwall in April this year and I come home to parking ticket for Fistral Beach. I went there because I read there was beach wheelchair. I not was sure if I could use the beach chair because I not have good upper body control but I wanted go see. when get to car park I check metre and say no parking free for disabled blue badge which I have blue badge. so I needed get some change pay meter so I go to get change and look at chair at same time as in same shop but problem was I had get over sand to get to shop and I get stuck in the sand. it take 3 people to rescue me and my wheelchair from sand and then I decided I just go home cause I hurt me foot when got stuck and it scard me. so we go back to caravan. I not was drive my husband was drving. he take me back to van and make sure I ok give me meds and clamp my chair back in van. I write to Smart parking and I exsplain all this to them and tell them it takes lot time to clamp and unclaimp a wheelchair and it not was my fault I not could get over sand to get money and we not did think parking have no free parking for disabled at all most have least some free parking even if it half hour. we only was there from 2.34 to 3.07pm all time take unclamp me and clamp me back in and to get stuck and unstuck in sand I is real glad people help me get unstick from sand or I still be stuck there now. I tell people at smart parking they can see my blue badge in the pictures they took of the van. so they know I was disabled and they can tell it wheelchair van with lift so it special van have clamp wheelchair in. but they say fine still stand and say MUST pay fine on same day as they WROTE the letter to me on 9th of june but I only get letter today. or they send it to debt collectors. so they now going send scary people my door because they not give me time to pay and I no feel I should pay for getting stuck in sand trying to get change for machine. it not like me was there for 2 hours swim in sea and catchin sun. wish me had because it my dream go on beach but now they take my dream away to ever try go beach again. on letter say they have tell me about obusman but that they wont deal with them so I am lots confussed about that. but give me a number I can make complaint to POPLA? I gots letters me got scaned and picture of marks me left on beach and me sent picture of marks me left on beach to them to I not can work out how attach them to this post sorry. I am scared they will send debt people my door. and they put charge up more. it was £60 if pay with in 28 days now £100 cause me made complaint that me think is wrong to no should be made to pay more for making complaint. I am trying read everything on site I read rules say to and only to post if still cant find answeres but I am scard because they give me no time to pay or complain as I ment pay by now but only get letter today. how do i attach things to here to show you? No doubt Smart Parking employees will be sleeping happily in their beds tonight, pleased to have the prospect of another £100, and the satisfaction of dashing this lady's dreams of ever going to the beach again. Shame on you, Smart Parking. Messrs Hurley and Davies of IPC fame are apparently expanding their business interests into Australia, as this website shows. Patron Hallow is one of the side businesses of the Red Cow Gang. 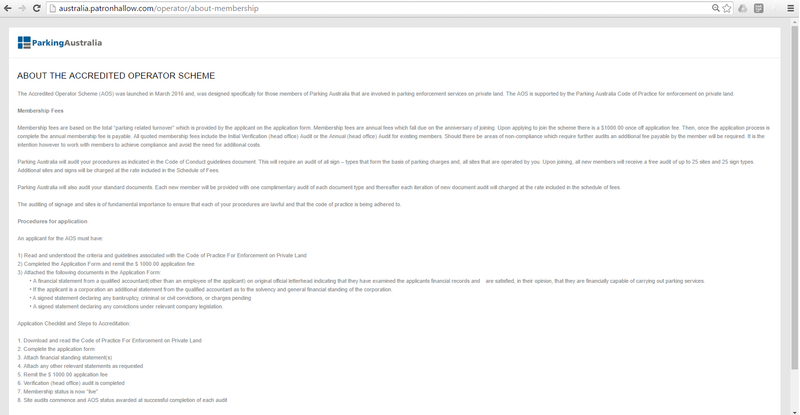 Amusingly, the site editors forgot to remove the reference to the 'IPC Code of Practice'. Perhaps this is not so silly as the actual code of practice appears to have been lifted word for word from the IPC. 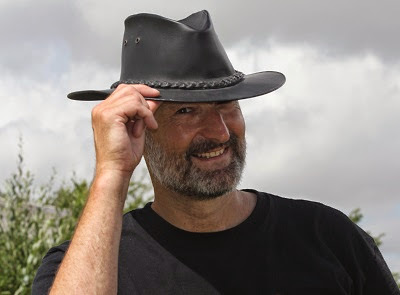 The Prankster warns Australia that the IPC has not been a force for good for parking management but has started a race for the bottom and a general lowering of standards across the industry, with forum shopping rife amongst operators. Complaints about IPC operators form a large part of The Prankster's postbag, and Hurley and Davies have been noteworthy for their slippery attitude to legitimate complaints and total failure to do anything at all about them. Both their complaints procedure and their appeals service are in The Prankster's opinion a joke, with the appeals service showing all the characteristics of a kangaroo court**. 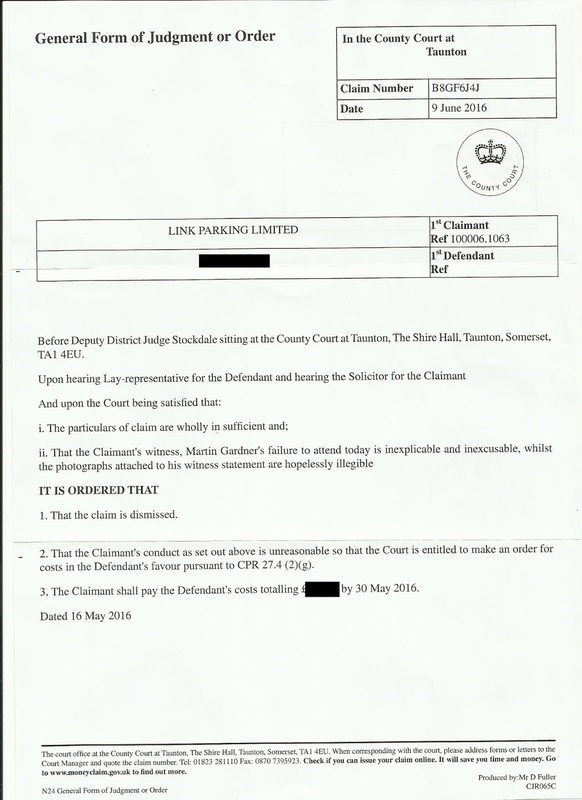 Although The Prankster has no idea of the level of knowledge of Hurley and Davis of the Australian Legal System, their knowledge of the UK legal system regarding parking is apparent from the wide number of failures of their firm Gladstones in court, with their main claim to fame in the cases appearing to be the increase in Gladstones bank balance at the expense of the parking operators. 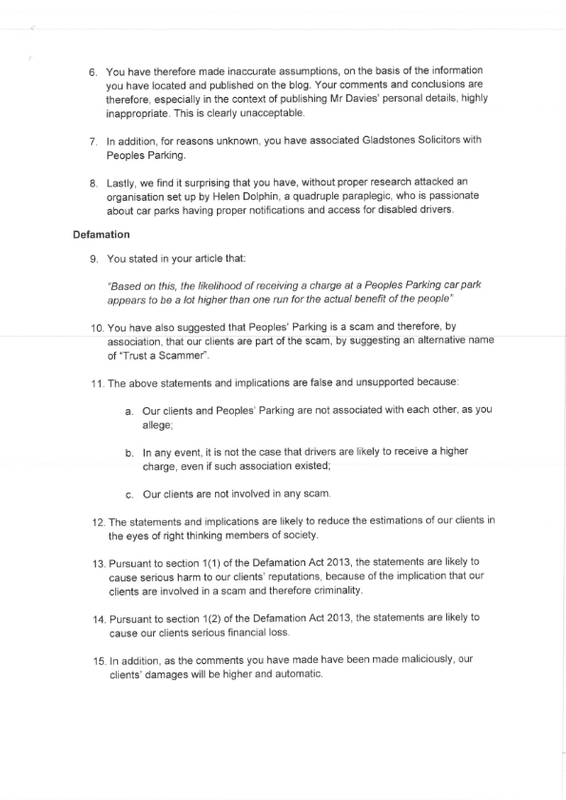 The only case thus far reported to The Prankster where Gladstones client won, Link Parking, resulted in them getting their contract terminated for their unreasonable behaviour towards motorists, The Prankster therefore warns Australia to take any advice from Hurley and Davies with a pinch of salt and to do their own checking. 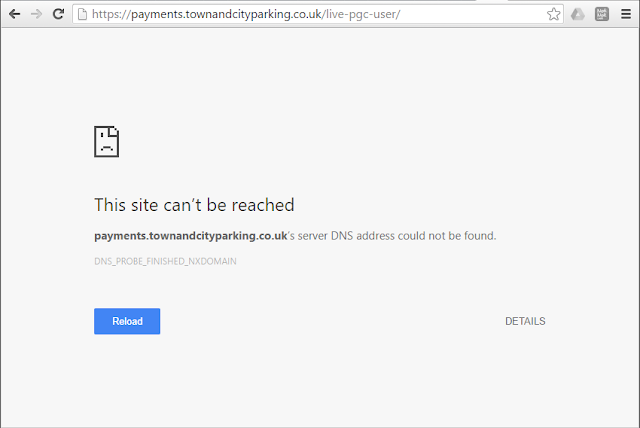 Smart Parking's payment website appears to be down. The Prankster suspects a fiendish plan; payments can only be made by hand at the Smart Parking office - but parking there will incur a further £100 charge. Alternatively, they may have forgotton they bought Town and City a few years ago.